From viewing in the garden, to displaying in the home. It was ironic. After all, at that point in my life I’d spent the last couple of decades designing commercially grown flowers for a living. I had also begun a new sideline business of traveling under sponsorship to conduct workshops and speaking engagements on the topic. Now there had been a change in my personal life. Having sold our condominium, we now inhabited our first property measured in acres as well as square footage! Prior to our ten year old house, the land had been occupied by corn and soybeans. The home’s builders planted 5 trees in their attempt to get back to nature. That’s right, 1 tree per acre! The gardening world had been my oyster. Now we looked over multiple perennial beds, containing a rotating mix of flowering blossoms. Somehow though, I was reluctant to cut them. It seemed that the garden was their natural place. Those blooms would last longer and re-supply both the plant and the soil, I reasoned. To display them in the house would be to interrupt that process. We need to learn to stop and smell the roses, right? For a couple of years I worked, observed, and appreciated our flowers in their “native” environment. 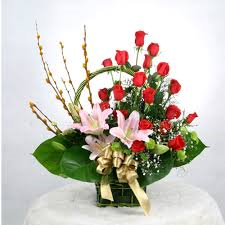 I was also studying Ikebana (Japanese floral design), which has an underlying element of honoring nature’s creations. Somehow these diverse ingredients created an epiphany for me, and I gained a new understanding of my role in this process. I came to understand that a few simple rules would keep me in balance with the garden’s trophies. First (and most important) do not cut more than you need. Second, every flower and foliage used should have a purpose in the design (if one flower is hidden behind another, it was not needed). Third, do not underestimate the bud vase (sometimes a single blossom delivers the entire message). Since my epiphany I feel free to cut, arrange, and display flowers. At all moments of the process I try to be aware. Knowledge of design is not the prerequisite here; it is the honoring of nature’s beauty. About a decade ago, we began planting with more focus on plants which could be harvested for design use. Awesome stands of curly willow and autumn sedum have yielded fresh product for altar pieces and bridal bouquets. Dragon-eye pine and zebra grass leave people asking where we find product. The answer of course, is a stroll outside the house, where most of it remains un-touched. 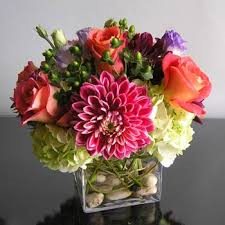 Don’t be afraid to bring a carefully chosen harvest inside, or take a bouquet with you as a hostess gift. After all, if they don’t respond to the beauty of flowers, why are you spending time with them anyway? So go cut some flowers, enjoy the process, and share the beauty with others! This entry was posted in Floral Arrangements, Gardening, Interiorscapes, Landscape. Bookmark the permalink.